View content at four times the resolution of 1080p with the LG SJ8500-Series 55"-Class HDR SUPER UHD Smart IPS LED TV. It will upscale lower-resolution video sources to near-4K quality for improved clarity. 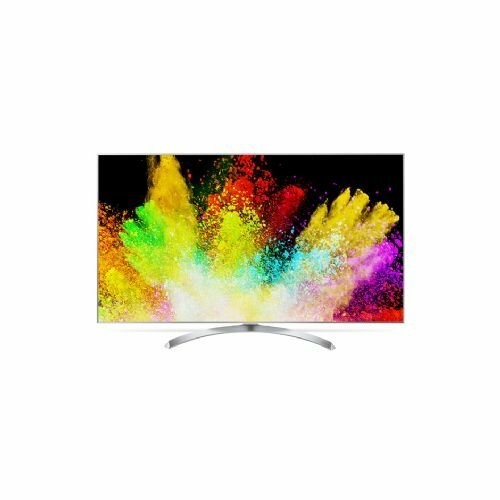 This TV has a 54.6" IPS LED display for enhanced viewing angles. Being HDR10-, Dolby Vision-, and HLG-compatible, it can display a wider range of color with compatible content and devices than non-HDR displays. The SJ8500 has built-in Wi-Fi and Ethernet connectivity to allow access to your favorite apps and Internet-based content, via the LG Content Store and the integrated web browser. With four HDMI inputs, there are multiple options for connecting high-definition video sources. It also features a component RCA input that doubles as a composite RCA input for analog sources. Three USB ports are onboard for connecting multimedia peripherals like flash drives. Without Stand (WxHxD): 48.4" x 27.9" x 2.3"
With Stand (WxHxD): 48.4" x 30.1" x 9.7"